Heathland is a man-made, but ecologically valuable, habitat. 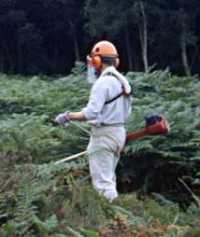 The heaths of southern England were created on areas of soil too poor for crops, and historically were maintained by grazing, burning and collecting fuel wood. As an artificial habitat, open but not cultivated, heathland supports many unusual and specialist species. With the loss of traditional management, and conversion to other uses, lowland heath is now scarce and declining (down to about 16% of its nineteenth-century extent). 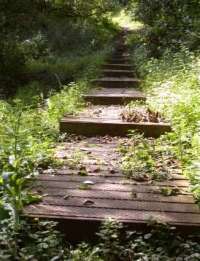 It is a priority habitat under the UK Biodiversity Action Plan. Without management, heathland is invaded by scrub, and (although it may host more species in total) widespread generalist species benefit while heathland specialists decline. The grazing pressure from the cattle now on the commons is not enough to keep the area open, so we clear invasive (mainly birch) and non-native (mainly sycamore) trees and scrub to prevent the common turning into a wood. 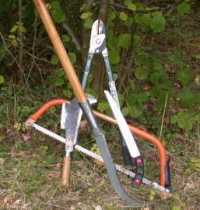 We also carry out coppicing in the woods surrounding the central heathland plateau. Most of this work is done with hand tools (bowsaws and loppers) but properly trained members and WBC staff also use chainsaws and brushcutters. Where appropriate, we treat the stumps with herbicide to prevent re-growth. Logs are stacked into habitat piles for amphibians, reptiles and insects, and we usually have a bonfire for the brash. We attempt to control ragwort and bracken. That's a never-ending battle, but we also hope (and are on course) to completely eradicate Himalayan balsam from the commons. We have also cleared most of the rhododendron, although it was never such a widespread problem here as it is on many heathland sites. We are sometimes asked why we are cutting, pulling up, and poisoning plants! Many people have the impression that all plants, or at least all trees, are “a good thing” and don't understand why conservationists would want to kill them. So in case you're asked, links on the left provide information on some of our target species. While some (like birch and bracken) are native species, others are introduced aliens. Globally, invasive introduced species are the second greatest threat (after habitat destruction) to biodiversity.